Afternoon all, just a quick post to show a card I've made for the 4th birthday celebrations over at Less is More! Who would have thought that when Mandi and I began a challenge blog for Clean and Simple cards that it would have had such an impact on Blogland. It was a success from the outset (for which we thank you most sincerely) and seems to have influenced the ethos of several other CAS challenges which have sprung up since then. Now lots of challenges request that participants comment on their fellow crafters, something that we felt strongly about... everyone loves a friendly comment don't they! Today we have people from all over the world joining in with our challenges and the standard of entries is simply superb! We are lucky enough to be joined this week by representatives from lots of the fabulous companies which sponsor us, and there are lots of goodies up for grabs from them this week! So a huge THANK YOU to them and lots of good reasons for you to join in! I used an Imagination stencil with Spun Sugar DI and added some grey highlights with a pen. I cut out the bird on some dotty card and matted onto the same card. The base card is obviously grey! The sentiment is an old SeeDee on stamped in grey versamark and shadowed with Spun Sugar. Have to run as I'm due at Aquafit and then Rock Choir! Carol has just suggested that I add it to Imagination Crafts February challenge which is anything goes! 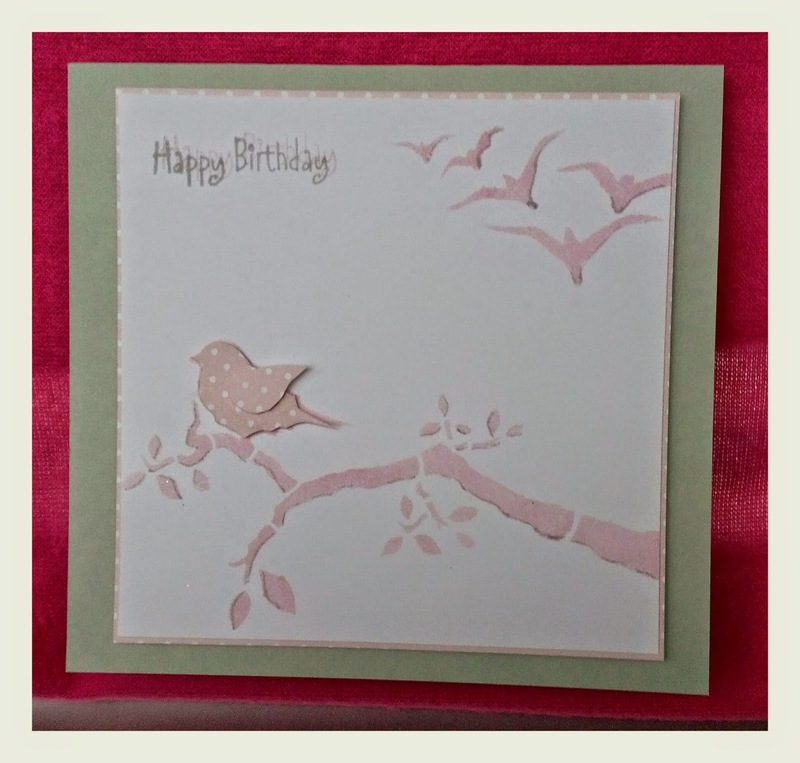 Pretty card Val - love the pink and grey theme Chrissie has chosen, so delicate. Have fun at aquafit and rock choir. It was great to see you at the weekend Val, it was fun to catch up a little. Your card is pretty, I had forgotten all about See Dees..I used to have some too... probably still have somewhere or other! The stencil is lovely too! Love how you used the beautiful pink and grey colour combo Val - the polka-dot bird is fabulous! A beautiful CAS card, the colours go so well together. It is very pretty- has a Japanese vibe to it! Love the delicate colours on this pretty card - bit of a grey day here too. Soft, delicate and quite Asian creation Val, love it!